Keytty, control your mouse with the keyboard on macOS. Keep your hands on the keyboard! Try it for free Buy meow! Adopt Keytty for only the price of two cups of coffee! Move, Click, Scroll, Drag and more with a few key strokes. Press ⌘(Command) twice (quickly) to open the Keytty interface. You can type the commands listed below after you open the Keytty interface. 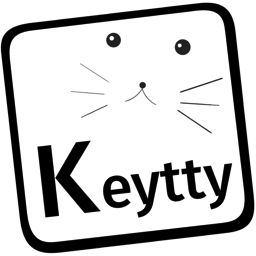 To use action, Type "A"
Keytty is an app for macOS (OS X) only. Keytty is not intended to replace a mouse or trackpad. You can control your mouse cursor actions with Keytty most of the time but you can't override the OS level controls (for example, Mission control, Launch pad, Log in, etc.) since Keytty is only an app running on the OS. Home | Support | Contact | How to use 한국어 Keytty and related materials are copyright © 2016 Heechul Ryu macOS (OS X) is a trademark of Apple Inc., registered in the U.S. and in other countries.